Fuse box’s are obsolete, outdated and may be unsafe. Not user friendly. Changing fuses can be frustrating and difficult. The box is to small and there is no space for additional wiring. 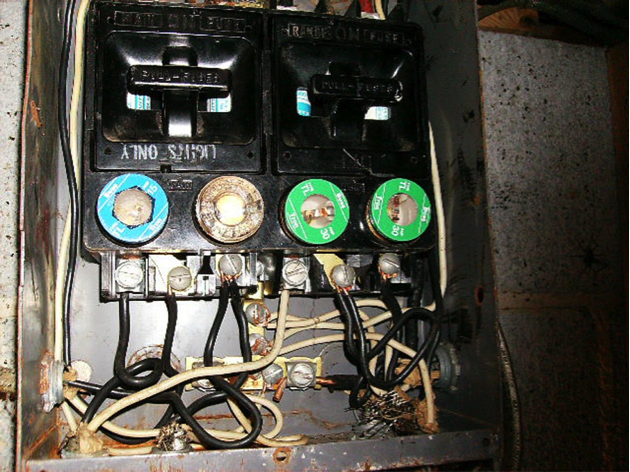 Your insurance company may not renew your homeowners insurance with an outdated fuse box. Fuse Box panels, as shown above have become obsolete and in many jurisdictions a homeowner cannot get home insurance if they have a fuse panel installed. Insurance companies see the convenience to over size the fuse on a circuit as a potential hazard. Have you ever wondered how much the electrical system in your home has changed in the last 100 years or so. The electrical service panels have certainly changed and here’s how. Electrical service panels have come a long way in the past decade. Almost every home has some type of service panel, whether it be a fuse panel or a circuit breaker panel. Commonly, these service panels are located in utility rooms, garages, or basements. Along with these service panels, it’s likely that you have a subpanel that controls other areas of your home, garage, or outbuildings. Before 1950, a 30-amp fuse panel was the norm. 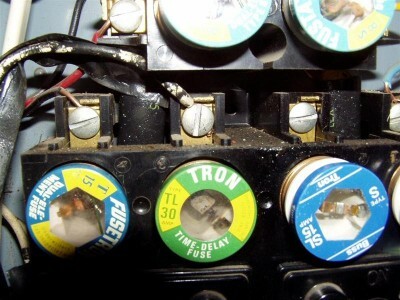 These fuse panels featured two plug fuses to protect the branch circuits and a knife-blade switch to disconnect power. The fuses were installed in a ceramic fuse holder, which was mounted within a black metal enclosure. This 30-amp service panel supplied 120 volts to a home, unlike the 240 volts today’s service panels do. These panels are no longer sufficient in today’s age and must be updated to at least a 100-amp circuit breaker panel to satisfy both FHA and other lending institution requirements for home sales. Besides, you’ll be needing much more power in your home and definitely much more than this service panel can provide. Between 1950 and 1965, a new age of service panels emerged. The 60-amp service panel became widely accepted and preferred. This panel was mounted inside a gray metal cabinet and featured a 240-volt feed. It had two cartridge fuse blocks and four plug fuse blocks. The first cartridge fuse block was used as the main disconnect and held 60-amp fuses. The other was used as an appliance feed and held 30-amp fuse. It fed power to things like electric dryers, water heaters, ovens, or electric ranges. The four plug fuses allowed for four individual branch circuits. In smaller homes with little electrical needs, this was often sufficient to power the home. These panels did have their limitations also though, as they could not support more than one 240-volt feed or more than the four individual branch circuits. It did, however, offer a panel schedule index that was placed inside the door of the panel so that the circuits could be labeled as to where they fed within the home. Finally in the 1960’s, the circuit breaker panel was invented and has become the standard ever since. It not only provides expandable circuit spaces, but also provides 240-volt, 100- and 200-amp services to homes. This panel features a main breaker and two rows of circuit breakers that are used for branch circuits. This panel allows you to supply power to outlets, lighting, and subpanels in and around your home. Circuit breakers started a new age of resettable devices, unlike fuses that had to be changed when they blew. Circuit breaker panels are the norm in housing today with 100- and 200-amp circuit breaker panels being the most common. In fact, 100-amp panels are the minimum allowed. Besides the main breaker rating, these panels have different amounts of circuit breaker spaces. One may have 12, while other may have 24 spaces. These panels have a neutral buss and often a ground buss. A panel schedule is offered to provide a way of knowing which breaker feeds what device or circuit throughout the home. Is a home equipped with fuses less safe than one equipped with circuit breakers? The answer is complex but, decidedly yes. A home equipped with a fuse panel is almost always less safe than one equipped with modern circuit breakers. There are some old circuit breakers that are also very hazardous, perhaps more hazardous than fuses, but that is a separate discussion. I have to answer that fuse systems are less safe even though paradoxically, the fuse itself is one of the best ways to protect an electric circuit from overloads and short circuits. Those are the same two jobs that modern circuit breakers do, and fuses actually do them better. Unfortunately, fuses come with baggage (secondary and associated problems). It is this baggage that creates safety issues and makes fuses impractical in home use, so impractical that we recommend replacement in almost every case. What are the problems associated with fuse systems? Over Fusing. A properly sized fuse protects as well as or better than a circuit breaker, but once they have done their job and blown, they need to be disposed of and replaced with a new fuse. Here is where one of their biggest flaws becomes evident. Most fuses can be incorrectly replaced with a fuse that has too high or too low a set point. This can cause inconvenience with an undersized fuse that blows too easily or it can cause overloading of the wiring systems if an oversized fuse is installed. This overloading can result in a fire. Over time we find that misapplication of fusing almost always ends at over sizing of the fuse in use. In extreme cases, desperate people have been known to install coins or other objects under a blown fuse completely eliminating any and all circuit protection. Over fusing is a hazard; bypassing the fuse is an insane hazard and should never be done. The photo below shows a wire that is only rated to carry 15 amps connected to a 30 amp fuse. You may notice the insulation on the wire is beginning to break down due to the heat caused by excessive current passing through it. Complexity.Even though properly applied fuses work well in protecting circuits, the average homeowner does not have the knowledge, training, test equipment or other tools to properly interact with a fuse systems over time. If power is interrupted to outlets, lights, or appliances in a home, it takes specialized knowledge and training to even determine IF a fuse has blown at all or which fuse has blown. In some cases there is visible evidence of a blown fuse if you know what you are looking for. Often you need to test to find the blown fuse. Uninstalling and reinstalling fuses while hunting for the problem only compounds the misapplication problems outlined in #1 above. In addition, an empty fuse socket exposes energize portions of the system to people working on the fuse system. Even if you install the same size fuse you removed, there is no guarantee that it was the right size to begin with. To compound matters, these issues are often dealt with in the dark. Limited number of circuit connection points.The most common fuse box we see in residential installations is equipped with a set of fuses for the “main disconnect” a second set for the range, and four screw in branch circuit fuses for the remainder of the home. This is all that was needed in the early 1900’s when these systems were installed. A few of the most modern versions of the fuse panel had eight or ten branch circuit fuses. In my 30 plus years as an electrician I cannot remember ever seeing a fuse panel in use in a home that did not supply more circuits and more load than it was designed to handle. Modern living requires power to many devices, most of which did not exist when fuse panels where commonly installed. Even the smallest, most modest home can barely get by today with a 20 space circuit breaker panel if wired to meet the needs of the occupants. The six circuits available in an outdated fuse panel fall far short. Fuse Panel? Replace it. You will never be sorry you did, but each year many people are sorry they did not! Age.Fuses have not been installed in homes for many decades. Electrical codes change every three years to continually improve the safety of electrical systems that are installed. As a result no fuse panel currently in use in any home in the United States would comply with minimum code standards in effect today. This makes them inherently less safe than any system installed more recently and in my opinion places them firmly in the category of being obsolete and needing replacement.In addition, older electrical systems have typically seen many stresses, environmental moisture, and modifications by nonprofessionals, and on and on. Improper modification is one of the most commonly seen problems. The most common of these is tapping more than one conductor from a single connection point. The list of improper modifications that can be made is very long. In short, any older system is typically less safe than a newer system and most fuse systems are very old. Insurance issues.Because of all the problems that are usually associated with fuse panel installations, insurance companies will sometimes charge a premium for homes with fused services. Sometimes they will decline to insure the home.